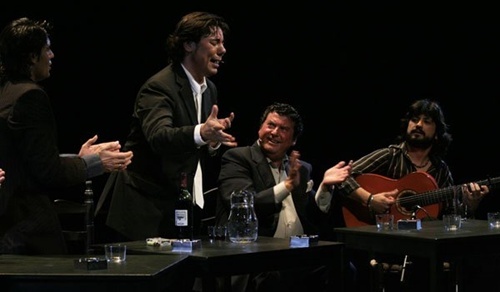 Tuesday’s Miguel Poveda‘s “Sin Frontera” was probably the best flamenco singing concert of the Suma Flamenca 2009 season. Just excellent. Having seen him sing in last year’s Suma Flamenca I knew we were in for a good concert. This year it took place in the beautiful old Teatro Häagen-Dazs Calderón on the Plaza de Jacinto Benavente. The ticket collection was nothing short of chaos for everyone and the show started late because of it, but in the end we were seated in one of the private side “palco’s”, slightly above stage level, and directly alongside the third row. Perfect. The stage and band orientation is a common theme among Miguel Poveda’s concerts. There, you have 2 or 3 wooden tables with chairs all around where the guitar players, palmeros, and singers sit. On the tables are glasses and pitchers of water for the thirsty. Oftentimes, when not singing or clapping, those at the tables will knock in rhythm on the table’s top. One male dancer, Andrés Peña, entertained the sell-out crowd to several numbers throughout the concert. At the end of the evening, when the last song was sung, Miguel Poveda and his band got a much-deserved standing ovation and an all-in-unison chanting clap as they left the stage. Miguel Poveda is an excellent singer and already wildly popular in the flamenco scene, although still young at 1973 (and born in Badalona, Barcelona, Spain). Who says flamenco doesn’t come out of Catalunya?! 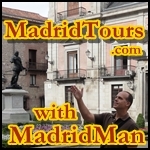 At just 15 years old he was singing in the Flamenco Peñas throughout the region. In 2003 he moved to Sevilla. 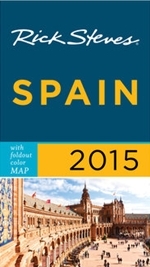 This entry was posted in Entertainment, Flamenco and tagged flamenco, flamenco singing, Miguel Poveda, Sin Frontera, Suma Flamenca, Teatro Calderon. Bookmark the permalink.